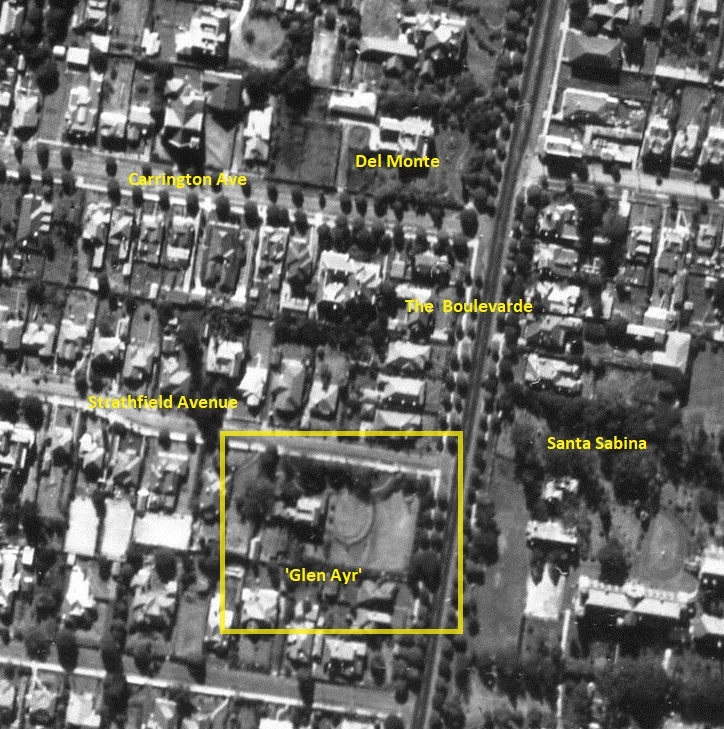 The house ‘Glen Ayr’ was located on the corner of The Boulevarde and Strathfield Avenue in Strathfield. The house was originally known as ‘Lynton’. ‘Lynton’ was built by Walter Sewell Buzacott, proprietor of a ships chandlery business, in 1883. Peter Mathieson, successful city businessman (tobacco, retail and property), lived at ‘Glen Ayr’ (formerly ‘Lynton’) from 1906 to his death in 1953. Following Mathieson’s death, the property was sold to John Olley Sherwood, a prominent tennis player of the 1920’s. Sherwood subdivided the land into six lots, which were sold in 1953. The house has since been demolished. Walter Sewell Buzacott (1838-1916) was my great grandfather. He was born in Great Torrington, Devon. His uncle George Hitchcock had a large drapery shop near St Pauls London, Walter started working there when he was 14. One of George Hitchcocks employees began a Young Mens Mutual Improvement Society for the young men working in the shop – out of this developed the YMCA. The smoke laden air of Victorian London so affected Walter’s lungs that he became ill and, in 1858 at the age of 20 he decided to emigrate to Australia. Two older brothers and an uncle who was a retired missionary to the Cook Islands were living in Sydney. He got a job at David Jones as soon as he arrived in Sydney. He married in 1863 and soon after went into partnership with his father in law in a ship chandlery business. Around 1890 the ship chandlery business ran into problems because of the shift from sail to steam and I think this is why he had to sell Lynton. My grandfather Ernest Walter and his brother Walter Verney continued the business but the focus changed to Everything for the Man on the Land. Walter Sewell Buzacott was one of the founders of the YMCA in Sydney, also of the Sydney City Mission, and he was very active in the Congregational Church. I was 11 when my grandfather died and I do not remember him ever talking about Lynton. However, I do have some books with a stamp W S Buzacott, Lynton, Redmyre.